Sitting in Figueretas, the Hotel Don Quijote is just 50m from the beach, and only 10 minutes’ walk from the Ibiza Town’s centre and port. A modern place to stay, the hotel’s rooftop terrace is a great place to unwind, with views of the sea and the historic Dalt Vila. Rooms offer wi-fi access, safes, TVs and full bathrooms. Just a short walk from Ses Figueretes beach, the smart and convenient Hotel Central Playa is within walking distance of central Ibiza Town and the port, and 15 minutes’ drive from the airport. Soak up the sun, take in sea views and have a swim on the rooftop terrace, unwind in the lounge or bar/restaurant and enjoy the convenience of a 24-hour reception service, which offers excursion booking and club tickets. Rooms are air-conditioned and offer free wi-fi access and satellite TV. Found in 3 mid-19th century buildings, Ryans La Marina is a modern boutique hotel, overlooking Ibiza’s port. Renovated in 2015, the hotel is home to a Gastro Pub, where you can enjoy a selection of tapas, and a Sports Bar, the hotel also has a 24-hour reception service and free wi-fi. Rooms are air conditioned and have satellite TV, safes and private bathrooms. With a stay at Apartamentos Playa Sol I in Ibiza (Figueretas), you'll be a 4-minute walk from Bossa Beach and 6 minutes by foot from Figueretas Beach. This apartment is 2.4 mi (3.9 km) from Port of Ibiza and 3 mi (4.8 km) from Talamanca Beach. Welcome to Gran Hotel Montesol Ibiza, Curio Collection by Hilton. Established in 1933 – the first hotel on the island – this iconic building and official Property of Cultural Interest is set in the heart of the city, next to the harbor. Walk the cobbled streets to local shops, restaurants and nightclubs, and take in the gorgeous beaches and natural beauty of this vibrant port town. The ancient bastions and modern markets of Dalt Vila, or ‘Upper Town,’ a UNESCO World Heritage Site, are just steps away.Gran Hotel Montesol keeps its historic charm façade, and has been refreshed indoors by Spanish designer Lázaro Rosa-Violán. 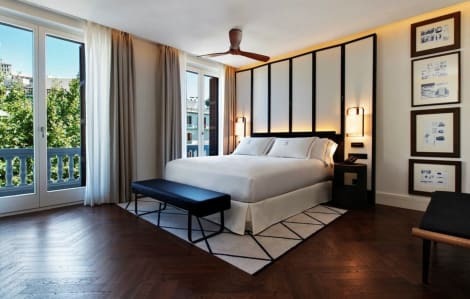 The 33 guest rooms are elegant, with comforts like WiFi access, a 55-inch HDTV, in room bar, espresso machine, adjustable thermostat, and bathroom with handheld & rainshower. Suites have a private bedroom and second HDTV, and many rooms have private balconies facing Ibiza Port and Dalt Vila.Visit the Café Montesol for Spanish tapas and other fine cuisine prepared with local ingredients – enjoy a meal on the breezy outdoor terraces during spring and summer months. Gran Hotel Montesol staff and personal concierges can also arrange events at Ibiza museums, yachts or historic buildings, as well as exclusive beach clubs and other experiences. Located in Ibiza (Figueretas), Hotel Apartamentos Lux Mar is within a 15-minute walk of Figueretas Beach and Dalt Vila. This aparthotel is 0.5 mi (0.9 km) from Ibiza Castle and 2.3 mi (3.7 km) from Port of Ibiza. The 3-star Apartamentos Panoramic are found in Figueretas, close to Ibiza town centre and just 300 metres from the beach. On-site you’ll find a large open-air pool area, with lounge chairs and Balinese beds, while the 24-hour reception offers club ticket and excursion booking services. The apartments and studios all offer wi-fi access, air conditioning, balconies, satellite TV, kitchen facilities and full bathrooms. Sitting between Ibiza Town and Playa d’en Bossa, the Apartmentos Playasol Jabeque Dreams are ideal for both clubbers and sightseers. The complex’s pool and terrace overlook the sea, and you can enjoy a drink while taking in the view at the Terrario Pool Garden. The apartments and studios have been refurbished in a contemporary style, and have air conditioning, fully-equipped kitchenettes, cable TV, safes, balconies and full bathrooms. Ryans Pocket is a cool and contemporary hostel in the centre of Ibiza Town, among the exciting energy of the S’Eixample district and within walking distance of the port and Old Town. The hostel offers free wi-fi access and a 24-hour reception with luggage storage and ticket and excursion booking services. Rooms feature bright, colourful and characterful décor, air conditioning, TVs, safety deposit boxes and bathrooms with walk-in showers. Found in Figueretas, just metres from the beach, the boutique Playasol Lei Ibiza Hotel is close to shops, bars and restaurants, and 3km from the centre of Ibiza Town. Filled with contemporary design and artistic style, the hotel offers a range of convenient facilities, including a bar and an open-air pool. Rooms are modern and stylish, and have free wi-fi, safes, air conditioning, flat-screen TVs and private bathrooms. An adults-only aparthotel, the 3-star Ryans Ibiza is close to Ibiza Town’s beachfront, by Playa de Figueretas and within walking distance of Playa d’En Bossa. Ryans Pub is a lively place to hang out, a combination of modern pub, urban beach club and rooftop terrace, it features DJ sets, cocktails and plenty more, you can also unwind in the pool or the rooftop Jacuzzi. Each apartment has a balcony or terrace, wi-fi, air conditioning, kitchenette, flat-screen TV and private bathroom with shower. 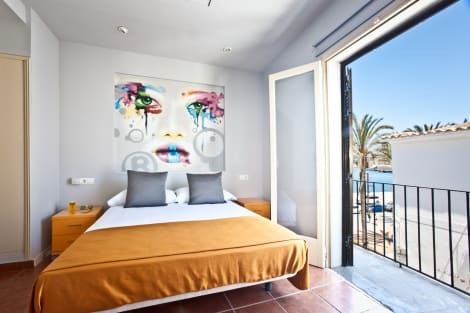 Chic and contemporary, the Santos Ibiza Coast Suites are close to Playa d’en Bossa beach, the Aguarmar water park and nightlife – including the Space Ibiza club. The hotel has a real party vibe of its own, with daily DJ sets by the open-air pool, which overlooks the beach, and you can also enjoy free airport transfers and on-site parking, and international cuisine in the bar and restaurant. The hotel’s studios and suites offer LED TVs, sound systems, minibars and free wi-fi. Situated in the centre of Ibiza Town, Hostal Ripoll Ibiza offers functional, air-conditioned rooms with free Wi-Fi and a laptop safe. The guest house is 150 metres from Ibiza Port. Each room at the Ripoll Ibiza has tiled floors and simple décor. The shared bathrooms include towels and a hairdryer. Rooms are cleaned and towels are changed every 2 days. Hostal Ripoll Ibiza is just 30 metres from the tree-lined Plaza del Parc Square, where you can find many popular cafés and restaurants. Pacha Nightclub is a 20-minute walk away. Buses and taxis stop on the street outside Hostal Ripoll. Ferries to Barcelona, Mallorca and Formentera leave from the nearby harbour. The apartments are located in the center of Ibiza town and 100 meters from the port within the commercial area of town, close to shops and restaurants. With immediate access to the waterfront bars, the gay area and also accessible to the Pacha nightclub. Complex of apartments newly renovated rooms. Offers TV, air conditioning and free Wifi access. Each apartment has a living room with large terrace and a kitchenette. Right by Ses Figueretes beach, the 3-star Hotel Playasol Maritimo is a modern place to stay, within walking distance of Ibiza Town’s centre. Particularly good for cyclists and active guests, the hotel offers an indoor pool and a gym, while its buffet restaurant specialises in healthy cuisine. Rooms are colourful and modern, with safes, air conditioning, plasma TVs, full bathrooms and free wi-fi as standard. Make yourself at home in one of the 117 air-conditioned rooms featuring minibars. Complimentary wireless Internet access keeps you connected, and satellite programming is available for your entertainment. Private bathrooms with shower/tub combinations feature complimentary toiletries and hair dryers. Conveniences include laptop-compatible safes and desks, and housekeeping is provided daily. Grab a bite to eat at the hotel's restaurant, which features a bar, or stay in and take advantage of the room service (during limited hours). Quench your thirst with your favorite drink at the poolside bar. Continental breakfasts are available for a fee. With a stay at Apartamentos Mar y Playa, you'll be centrally located in Ibiza, just a 3-minute walk from Figueretas Beach and 15 minutes by foot from Bossa Beach. This beach aparthotel is 2.3 mi (3.7 km) from Port of Ibiza and 2.4 mi (3.9 km) from Talamanca Beach. This family-run and family-oriented apartment complex is situated on the seafront next to Ibiza's Figueretes Beach. They are at an ideal location for both those who want to get to know the vibrant nightlife of the resort and its more relaxed and holiday-like spirit. Each of the bright and air-conditioned apartments is fitted with simple but comfortable wooden furniture and fully-equipped kitchen that is perfect for those who enjoy preparing home-like meals. The delicious masterpieces can be savoured on the balconies, to which all of the apartments open, accompanied with soothing sea views and the balmy breezes. Are you planning a non-stop party holiday to Ibiza? Check out our amazing range of lastminute.com deals on Ibiza hotels and grab yourself a bargain. Ibiza is the sun-kissed all-night party capital of the world and makes a great destination for when you really want to let your hair down. Six million tourists make the pilgrimage to this party island every year which means you’re spoilt for choice when it comes to accommodation. There’s a brilliant range of places to stay with a selection of hotels and villas to suit everyone’s budget. As you would expect, Ibiza is home to some of the best clubs in the world that play host to some equally well-renowned DJs like David Guetta and Luciano. One of the oldest and most well-known clubs is Pacha which first opened in 1973. Pacha’s famous for offering a special VIP service with its many private tables making it the playground of the rich and famous. It offers a mind-boggling array of parties with unique names such as Flower Power, Pure Pacha and Insane. Another club not to miss is Amnesia. The club has two massive rooms, one of which is designed to be specially flooded with light when the sun rises. The club offers unique experiences such as foam parties and ice cannons. A great way to explore the island in the day time is on the back of a scooter. The island has many companies that offer scooter hire and they’re a great way to whizz around and take in all of the sights. You should definitely drive along the west coast of the island which has some beautiful quiet roads with amazing views of the sea. When you want to take a break from all the wild partying you can explore the island’s history. The island has many areas that have been designated UNESCO World Heritage Sites that you really won’t want to miss. A great place to visit is the island’s cathedral called The Cathedral of Our Lady of the Snows which is constructed from a mix of different style of architecture. The original structure of the building is 14th-century Gothic but in the 18th century it had a major Baroque renovation. The cathedral has some exceptional works of art in its collection including two Gothic panels painted by Francesc Cornes and two painted by Valentí Montoliu.